Our full-service dog grooming includes bathing, cleaning of the ears (plucking if necessary), nail trim, blow dry, brush out, sanitary-area clean up, trimming and hair cut. Would you like your dog’s teeth brushed? 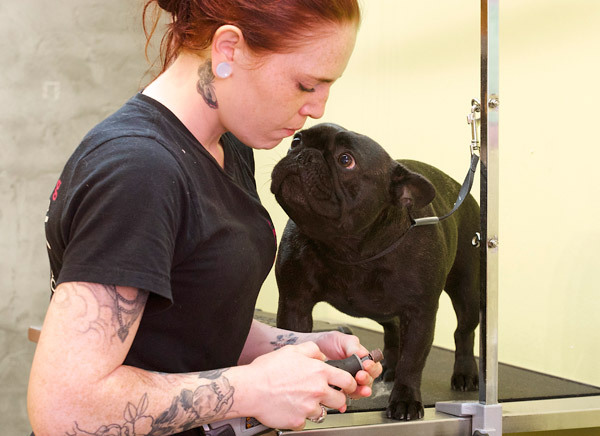 Our groomers will make them sparkle! Your dog will look and feel fabulous! For grooming services, please book a minimum of 1-2 weeks in advance. There is a 24-hour cancelation policy and first-time clients may be ask for a deposit to hold their appointment. A price quote is provided at drop-off time. Our shops carry a comprehensive range of products for your dog. Before you leave, browse through our excellent selection of dog food, toys, treats and other doggie wares. You will be sure to find something for you and your best friend.